Slip ring have been very widely used in all walks of life, serving as implementing the signal and current transmission in the rotation part and in the fixed part. It mainly includes the ring body composed of many metal rings, electric brush contacted with the ring body, a stent with a role of fixing and the coverage having the effect of protecting. The ring body is made through two methods including the injected one and the laminate-pressed one. High-quality plating treatments are usually made over the surface of the metal ring and brush filaments, and the coating is mostly precious metals, mainly serving as satisfying the requirements of slip rings such as the good conductivity, wear resistance and corrosion resistance, etc. 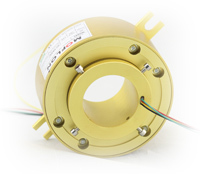 Due to wide applications, including in the high-tech and high demanding areas, of the slip rings, there is a very strict requirement for the performance of slip rings because some slip rings are often needed to use in the circumstances of high temperature, quake, and high �Cspeed rotation and so on. Moreover, they also should be confirmed their reliability to work in the special environments through a serious of experiments. We could take some tests under the situation of vacuum in different temperature and rotational speed to see how the different temperature and rotational speed exert impacts on the voltage signal and the SNR (Signal to Noise Ratio). Experiments show that under the vacuum state, increasing the rotational speed and temperature would lead to higher SNR of the voltage signal, however, even the temperature has increased to 100 degrees and the rotational speed is lifted into 1.2 m/s, the SNR is still greater than the number of 278/1, so we could draw a conclusion that, the temperature and rotational speed of the slip ring have little impact on the signal transmission, and the slip ring can basically satisfy the same environment. Dynamic resistance of slip ring? what parameters need to know for purchasing slip rings?